Governor Ron Desantis has been busy in his first month and he says he has no intention of slowing down. 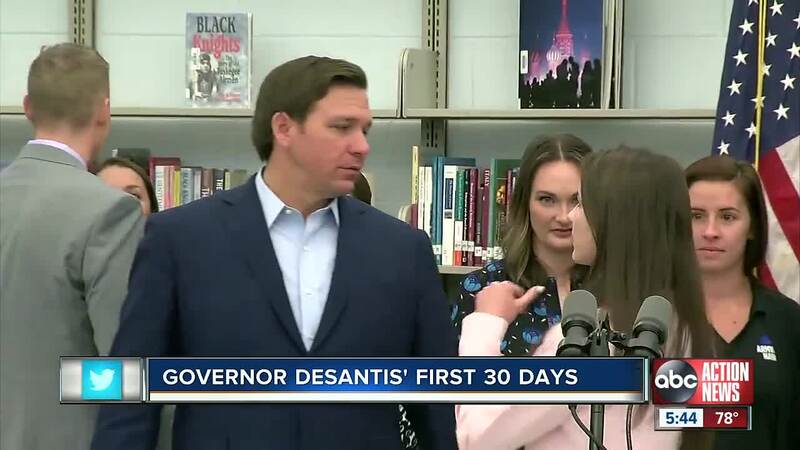 TAMPA, Fla. — Governor Ron Desantis has been busy in his first month and he says he has no intention of slowing down. According to a new poll by Florida Politics, a majority of the state's top lobbyist agree Gov. Desantis is doing better than expected. That includes the Democrats that were polled. “A lot of people are scratching their heads saying he’s not the Desantis that was running for Governor,” said ABC Action News political advisor Dr. Susan MacManus. She says the Governor is doing what the people want — working together across the aisle. Those key issues include the environment, with a plan to invest $625 million to protect the Everglades and water resources. Also teacher bonuses, tax cuts and medical marijuana reform. “This is really a surprise because he ran on what some would claim was a very ideological campaign. And talked more about Trump and perhaps the national government and not so much about Florida,” said MacManus. His $91.3 billion budget is higher than it’s been in the past, but she says Florida is also in better shape than it used to be.